I've had people ask about getting monthly or daily agendas that start in September, rather than in January. So I made some. These are small, pocket-sized books. 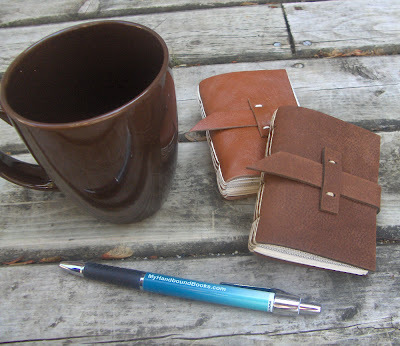 These mini monthly planners start in September 2009 and end in December 2011. 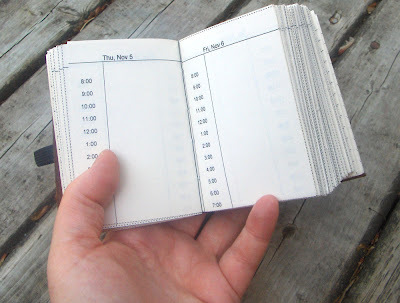 This daily planner is also mini, but chunky, at 3.5cm thick (1.5"). It has a full page for every day, so this one is great for really busy people with lots of appointments or lots of homework! Available on Etsy, of course. Really good idea and they look very tactile. Just discovered your blog yesterday, through Etsy, and am delighting in your tutorials, handmade books, and adventures in bookbinding. I’ve taken a couple of bookbinding and book sewing classes this year and am so intrigued by the form. Simply love your leather books! I’ll return often. thanks, Gina! welcome to the world of bookbinding :) have fun with it. Did you print the pages up yourself or purchase them from somewhere? catherine, i printed the pages. debera, not everyone has switched.